For a woman who has experienced a traumatic birth, the anticipation of her child’s upcoming birthday can be intense. When there is an event looming that threatens to take her back to the feelings of the birth, which she often has not had a chance to process, it can feel like being held captive on an out-of-control freight train. Birthtalk.org explores this challenging situation, and offers 5 tips to support you in preparing for an upcoming birthday after a traumatic birth…no matter how long ago the birth was. A child’s birthday can be a confusing event for a mother when the birth was difficult, challenging or traumatic. It can trigger a roller coaster of emotions ranging from joy that your child is a year older, gratitude that you have made it through another year, relief that you are further away from ‘that day’ of the birth, and sadness that you still feel so bad, even though another year has gone by. The party was meant to be about celebrating my son’s first birthday, but how could I – when I hadn’t actually celebrated him for myself? It was just a reminder that one year ago I felt confused, violated and traumatised by his birth. The countdown to a crisis? Turbulent feelings can begin in the days leading up to the birthday, as the anticipation of getting to ‘that date’ rises. This can be made more intense if the early labour or prelabour time was traumatic too. This situation is made even more confusing by the fact that our culture does not tend to recognise any negative emotions in relation to a birthday, except maybe a tinge of sadness that the child is growing up, with comments such as: “We’ll have to put a brick on your head to stop you from growing up so fast!” To most people, a birthday is a chance to celebrate the child reaching another milestone – which of course it is. And which, of course, deserves to be celebrated. But because the majority within our culture does not understand the importance of our birth experience to everything that comes afterwards – because they do not know that birth matters – our culture does not have a place within the celebration of a birthday to honour that it is the mother’s day of birth, too. Is it bad to feel bad about this special day? A lot of the distress around a birthday can come from the feelings of confusion and guilt about feeling so bad on what is supposed to be a day of celebration. So it is important, firstly, to understand and separate the feelings. Contrary to what you might hear, a woman’s acknowledgement that she feels bad about her baby’s birth does not make her a ‘bad mother’. It is not a reflection of her love for her child. It is simply a statement of fact – she found the situations surrounding her baby’s arrival distressing. Understanding this is so important, yet can be so difficult to grasp, as we tend to assume the ‘good feelings’ of birth come from actually getting your baby, and nothing else matters. And that if you get your baby, you must be happy. But that is only part of it. The other part involves how we feel while we are meeting our baby, which depends, not only on what happened during the birth, but also on factors such as: if we feel cared for, how safe we feel, how we are being treated, whether we feel we are being listened to, what information we are given. Feeling safe, acknowledged and respected is important for us to feel good about any major life event (think first day of school, first foray into dating, first sexual experience). Yet these feelings of safety, acknowledgement and respect are often lacking or absent in birth within our culture. It actually is possible for a woman to celebrate her child’s birthday milestone, at the same time as acknowledging she doesn’t feel good about what happened during the baby’s arrival. But only if she is supported in understanding that they are separate issues and that birth does have an impact. It is unlikely that a woman will receive the understanding and nurturing required from the people around her, who may not realise that she ‘still’ struggles with her birth. We find that most people expect that by the time the baby is six months old, any grief around the birth will be forgotten, and that a mother will have ‘moved on’. This is rarely the case when there has been a traumatic birth. My husband was supportive when I spoke with him and relived the memories with him, but I didn’t really feel comfortable telling anyone else what I was thinking; I knew they would all tell me that it was a year ago and he was here and healthy so it was time to forget about all that! On my son’s birthday, nobody acknowledged my birth experience or any of the things I had experienced in the lead-up and post-birth. Family and friends seemed to just want to ‘celebrate’ and nobody mentioned his birth at all. However, the anniversary of a birth – any birth – is worthy of reflection and pause. It is a mighty event in a woman’s life for herself, not just in terms of meeting her baby. Understanding and honouring this is essential in the journey to healing. Through our work with Birthtalk, we know many women within the birthing community who have a very different view of birthing than the mainstream. They have access to information about birth that is not readily available to most women…information that enables them to understand the importance of birth to what follows, and as a result, tend to see birthdays differently. Even before the baby is born, they are treating the mother differently. They often do not have a baby shower, where the baby is the focus, and showered with gifts such as nappies, musical mobiles and blankets. Instead, they often opt for a ‘blessingway’, a celebration where the focus is on the mother, and the mother’s journey through birth to meet her little one is honoured. The gifts are symbolic, usually beads or trinkets to signify strength, courage, determination, surrender – qualities needed for labour, birth and postnatal parenting. The mother wears these beads during labour, to remind herself of the emotional strength she has for this task, and of all the women who have taken this journey previously. We have noticed that when these women announce a child’s birthday on Facebook, it is often accompanied by a brief account of their birth experience. And their friends on Facebook usually make two comments: one for the child to wish them a happy birthday, and one for the mother, in acknowledgement of her anniversary of her birthing day. And if these women have had traumatic births, then that is acknowledged too. There is understanding and compassion that it might be a difficult day, as well as talk of the woman’s strength and determination. When birth is seen as the woman’s rite of passage, there is space to understand the gravity of the situation if that passage is traumatic. Sadly, in our wider culture, this is not usually the case. One young mum, Ainslea, came to our ‘Healing From Birth’ support group nervously anticipating her child’s first birthday in a week’s time. She shared with us that she had thirty-five people descending on her house for birthday celebrations, and she was feeling overwhelmed. Her biggest worry was two-fold: that she would get questions about when they would start trying for another baby, and that she would get jovial comments about her birth experience, which, unfortunately, took place quite publicly during a natural disaster. She worried that she wouldn’t cope with the questions, as she truly wasn’t sure if they would have any more children after the trauma of their firstborn’s arrival, and felt too vulnerable to share ‘where she was’ with that issue. She worried that she might ‘fall apart’ at the party, which was not at all what she wanted to occur. She did manage to get through the day unscathed, partly due to the healing path she was already on, after attending our sessions for a few months and partly with the help of some set answers prepared that enabled her to feel she was staying true to herself, without putting her heart on her sleeve. We share more about Ainslea’s experience in our tips section below. So how can you manage any growing feelings of dread and panic that arise as a birthday approaches? How can you deal with the people around you, who likely will not understand that this is a difficult day for you? And how will you deal with the actual day? Fortunately, there are a lot of things you can do to pave the way for an easier birthday period, and working through them can actually be extremely helpful in the overall healing process after a traumatic birth. As Ainslea found, it can be really helpful to take steps to actively prepare for the birthday itself. There is also much value in using the strong emotions arising as an opportunity to process aspects of the birth, and gain new insights about what happened to you. It can be a chance to take a few more steps along the path to healing. It is important to acknowledge that you are dreading or feeling uneasy about an approaching birthday, and also that you know why. It is not because you are a bad mum; it is because you have unresolved feelings about the situations surrounding your child’s birth. It’s important to remember that you are dealing with two different things: firstly, your feelings about the birth and secondly, your feelings about your child. You feel bad about what happened at your child’s birth, and don’t want to celebrate the experience of that. This is understandable, and reasonable considering your experience. But that is separate to how you feel about your child. If you feel that you can’t separate your feelings about your birth from your feelings about your child, this is okay, too. It is just an indicator that you have some work to do in your healing journey, to unravel your birth experience so you can separate the issues. You may not find the support you need, or the understanding of the magnitude of the birthday for you, from the people around you. So it may be up to you to honour your own milestone. You’ve made it through a whole year. You’ve been through so much. Honour the birthday as your birth day. It is special, not just because it is the day your child arrived, it is also the day you, as a mother, arrived. This is important, and worthy of honoring. Can you give yourself something symbolic to represent an honouring of how hard you’ve had to work to overcome this birth? Maybe a little potted plant to symbolise new growth, or a smooth shiny precious stone that symbolises strength and determination, or a fresh journal to document your healing journey … or even a new dress! I also re-watched the video of my son’s birth with my husband the night before his birthday – we cried a lot and saw all the things we had been trying to forget had happened. But I think watching it again helped us grieve too, because it reminded us that all the grief and sad feelings we had felt from time to time in the year since his birth, they really all had been legitimate reasons to grieve. When we went back and watched the birth video with all the knowledge of what birth could and should be that we have gained from Birthtalk since, it was a huge step for me to realise that night that I wasn’t crazy, I really did have these reasons to be sad. The birthday party is probably not an appropriate place to debrief the birth, so if you have not already, it might be helpful to write an account of the birth, to just clear it from your head enough to get through the party. While your birth may not have been empowering, you can certainly now plan for an empowering birthday event. As Ainslea discovered, thinking ahead and being honest about what you fear can give you insights into what you will find helpful on ‘the big day’. Ask yourself: “What am I most afraid of being asked/people saying?” When trying to compose a ready-made response, focus on the love you have for your child as a way to deflect an unwelcome comment, as Ainslea did, below. When she brought up her fears at our ‘Healing From Birth’ session, we did some troubleshooting as a group, coming up with some ideas of ‘what to say’ to fend off unwelcome prying questions that she did not feel comfortable answering. Ainslea’s new understanding about traumatic birth is evident in her answers, and, importantly, she knew that there was nothing ‘wrong’ with her for having mixed-up emotions about the birthday. Her healing journey continues. I experienced the lead up to my son’s first birthday as a confusing mish-mash of emotion. At this stage I did not know I’d had a traumatic birth – I still thought I had just ‘not coped’ with birth and had failed. I did not recognise a connection between how I felt about the birth, and how I handled the first anniversary of such a challenging experience. After planning a big party carefully, I worried unnecessarily about trivial things, and really worked myself into a ‘tizz’. I felt nervous about being the centre of attention, and felt a lot of pressure to display my mothering success. I found myself focusing a lot on my appearance – it felt incredibly important to ‘look good’ and, I realise now, to display the semblance of ‘a coping mother’. On the day of the party, I changed my outfit feverishly a number of times before everyone arrived; I was as stiff as a board with tension and stress, with my mind whirling the whole day. I was saved only by my son’s sweetness, my husband’s patience, and a fair bit of cake. I can speak from experience – it really does get easier over time as each birthday approaches – and it gets even easier if you do the work. It can be so hard to ‘go there’ and begin the healing journey, but the benefits can be far-reaching. After the debacle of the first birthday, I felt so much guilt, and sorrow, and even embarrassment that I was so ‘messed up.’ Until I began the healing journey, with much support from Deb (my sister-in-law, midwife and co-founder of Birthtalk). The process of exploring my birth, and beginning to understand the notion that my birth was having this impact upon me and my family, really helped pave the way for some much better birthdays. I became able to focus on the celebration this day was – the day my child arrived. I could join other people in truly enjoying the day as his birthday. It became a day of joy. In private, I would also reflect, and honour, and take myself back over the years since his birth. There was acknowledgement from myself, and my partner, and other women I had since met who understood that this birth was significant for me for reasons beyond presenting me with this gorgeous son. But these reflections no longer overshadowed the day. They were simply an acknowledgement of who I’d become, of all the gifts my son’s arrival had given me for the journey of being his mother. I couldn’t see them until I’d begun to heal, but they were there. It was a birthday gift to me; a Happy Birthday at last. 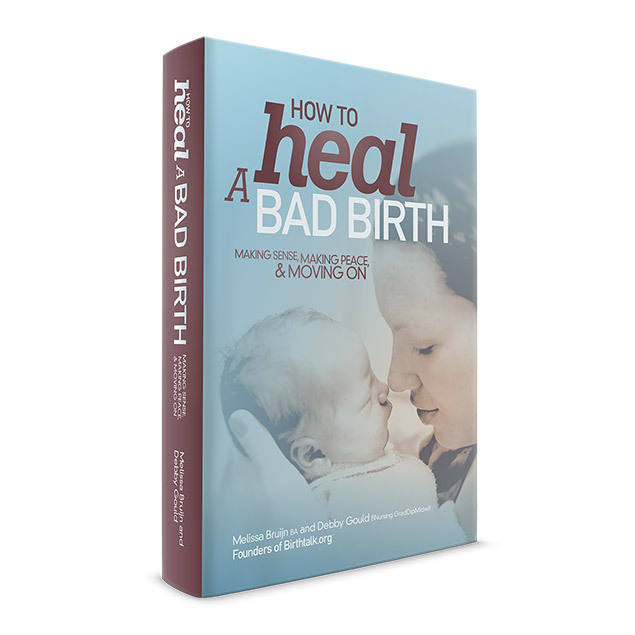 Excerpted from “How to Heal a Bad Birth – making sense, making peace and moving on.”, a new book by Melissa Bruijn and Debby Gould from Birthtalk.org. With thanks to Nurtured by Jen Photography for the kind use of the image in this blogpost. A wonderful article, so very helpful. Even though you have helped me so much heal after my daughters birth, it did take until she was 8 for me to celebrate her birthday where I felt peace. And it was amazing! All these points are so helpful, as it is So very confusing how powerful and painful your child’s birthday can be. In fact Melissa was the first person I contacted who understood this, because most people, even Psychologists I had seen couldn’t understand why I was making my child’s birthday about me. Which was even more unhelpful and hurtful at the time. I now understand that back then 9-10 years ago so few people understood birth trauma. I now know it wasn’t me trying to make the birthday about me, it was about the fact that my feelings about her birth had never been acknowledged. On my eldest son’s birthday I was re-living hour by hour what had happened on that day the year before and I was still in the process of working through the trauma. It was a subdued day for me but I had already done a lot of healing work at that point. I had my hospital notes with me and I understood them after going through them with Deb and I took time out on his birthday to revisit what had happened to us. Even though it was difficult to revisit it I’m glad I took the time to acknowledge what had happened and how far I’d come. I gave myself permission to have sadness about the events surrounding his birth, it was liberating and a big milestone in my healing journey. As I write this I realise its his birthday tomorrow and he will be 6! and I am very much healed from the trauma of his birth (with much thanks and gratitude to Birthtalk!). I am so glad you have written this, Mel and Deb! As a culture, we do quite poorly at juggling this milestone and its meaning for both mum and child. Sadly, as generation after generation experiences this kind of birth, I guess this becomes the self-perpetuating cultural norm – there is often no room to think reflect about your own experience of your child’s birth on the day without appearing selfish, and the people least likely to want to hear it are the other mothers in your family who are also dealing with their own traumas… I now have three generations of women in my family who spend birthdays busy so as not to be caught out with time to reflect – I only realised this once I became that third link in the chain. I wish I could have read such an article three years ago when I was preparing for the first ‘birthing day’ after a traumatic birth – I know many will appreciate this practical advice and the knowledge that they are not alone or selfish for needing this time of personal reflection on the birthdays of their children. Thank you! Thanks Melissa, you are such a wonderful person. Without You and Debby I might have given up the best profession in the world “Being with Women”, because my traumatic birth experience made me feel like a failure and how could I encourage others and tell them they can do this work when I as a midwife with so much more knowledge had failed so badly. I am glad and happy to be a mum and a midwife. My son’s first birthday passed by in a haze of severe PND and wasn’t really marked at all. We had recently moved so there wasn’t anyone around who was expecting a party or anything. However, by the time he was two (earlier this year) that had changed. I wish I had read your article beforehand – not only that, I wish everyone else had read it!! ← Do I Need to ‘Walk On Eggshells’ When Talking About Positive Birth to Traumatised Women?